What could be better than relaxing in your easy chair with a cup of hot tea or chocolate and listening to free Christmas music online? Christmas tunes have the power to take us back to another time and place - to stir up our memories of childhood and the myriads of experiences that form our image of "Christmastime" today. There's something comforting about the traditions of the season - the familiar tunes, whether hymns or secular, the lights, the sounds and colors of Christmas. Can you even imagine a Christmas without music? I feel certain that Mary was singing a lullabye on the night Baby Jesus was born - perhaps with the Little Drummer Boy close at hand. What a rich history we have! If you're feeling stressed with all the things you haven't done to prepare for Christmas, I invite you to listen to some music - close your eyes, and allow yourself to go back to a simpler time and place. 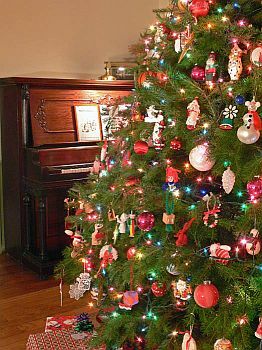 Click here for a piano sampling of Christmas swing tunes, Jazzy Jingle Bells (ragtime), traditional classic and other seasonal favorites - direct from my living room to yours. What are your favorite Christmas tunes? Which evoke the most precious family memories for you? I'd love to here from you right here! My top three favorites are: O Holy Night, Silent Night and Joy To the World. But there are so many great Christmas tunes that it's hard to narrow it down to just 3 favorites! After all, "It's the Most Wonderful Time of the Year!" Whether you want inspiration, laughter, the joys of childhood, the warmth of friend, family and the fireplace, the joys of celebrating love, life and the gift of a baby boy sent to redeem the world, the glory of snow and chestnuts roasting on an open fire.....just about any enduring emotion you can imagine can be capture in the magic of Christmas.